G-Fone today announced the launch of G-588 in India , G-588 comes for a price tag of Rs4799 .One of the unique features of this handset is that it can be used in two totally different modes like GSM + GSM or GSM + CDMA . 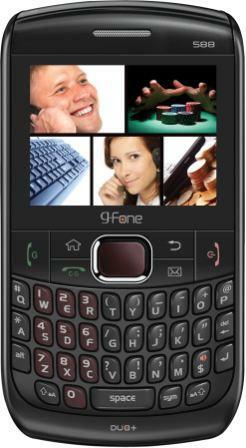 The G-588 also comes with a complete user friendly QWERTY keypad and its integrated with Nimbuzz the one single social networking application which would help you stay connected with your friends and colleagues through Facebook, Twitter, Skype and a host of other messenger services like, G-Talk, Yahoo, MSN, AOL, etc., so that you can Get More for what you pay. The Multi-Media player of the G-588 will give you the ultimate experience of mobile entertainment by enabling you to play mp3, mp4 and a list of other file formats and with an additional extendable memory of up to 8 GB. Another unique feature of the phone is the Indian Calendar. The Indian Calendar also serves as a guiding force for the practice of various Hindu rituals & festivals.